Hey guys, been lurking and gathering info. Alot of great info to be had here. We started off our first nano nearly 2 weeks ago and would like to share. 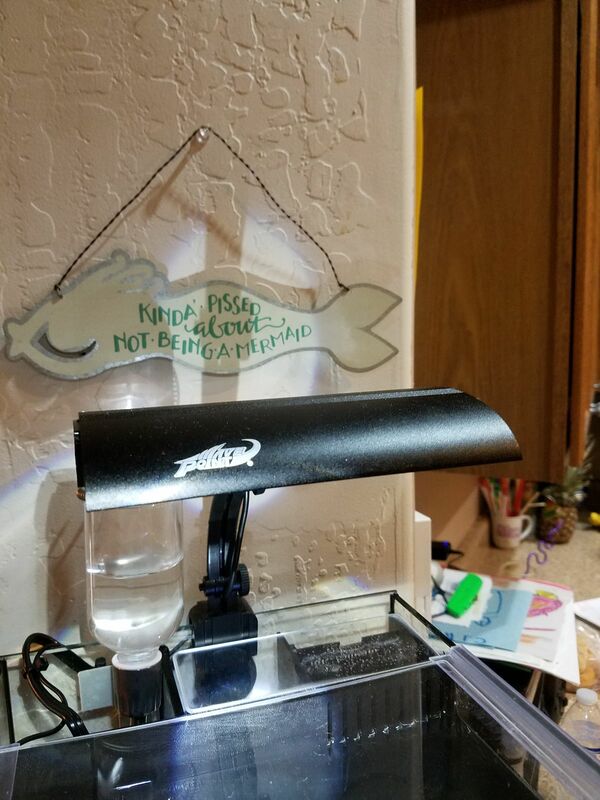 -Digital temp probe set in return sump Arizona summers.... kept at room temp. 78-80deg. 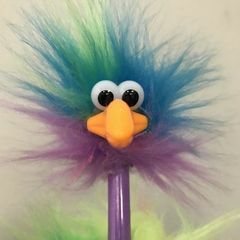 Please share comments or words of wisdom that could help me on my journey. 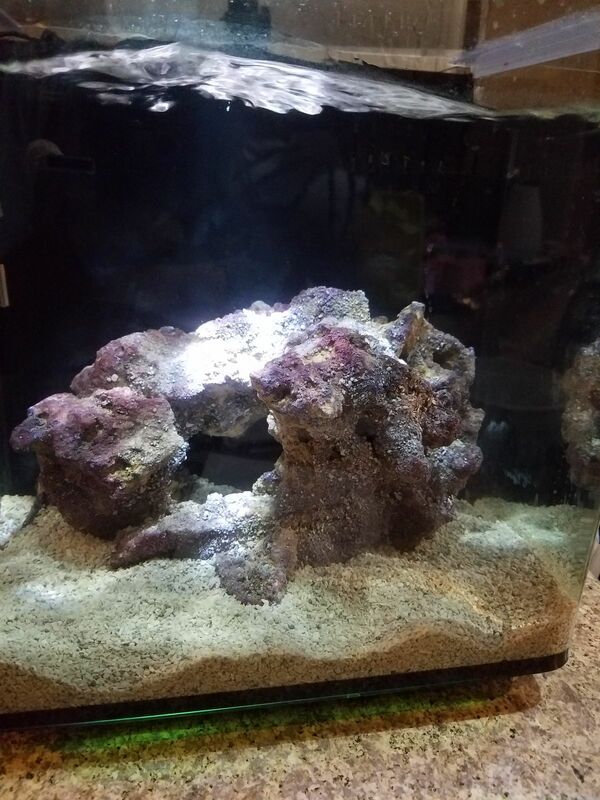 If you plan on keeping corals, I'd raise the specific gravity to 1.025 or 1.026. I'd probably also remove the rubble in the back chambers, as the live rock will be a sufficient biofilter. Finally, the sand is a little coarse, and might tend to collect detritus. You'll probably have to vacuum it regularly to keep it clean. Off to a good start. I’m curious how reversing the flow through the return pump negates the heat? Looks good though. 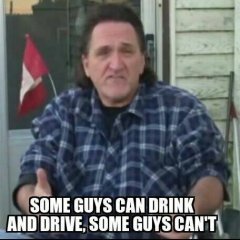 Seabass: Thank you for the advice. More if you got it, afterall I asked for it. First, is it worth it to start all over with finer grain sand? Second, Would you run any filter material in front of my plastic strainer in the 1st chamber after removing the media bag/rubble from the second chamber. 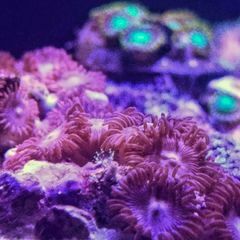 I will bring the specific gravity up as well as I do plan in introducing small frags eventually (recommends on coral to start with?) I am in no hurry. 1891bro: Same pump mounted lowest in the sump wall vs raising it up a bit in the sump was nearly a whole degree cooler. I've been keeping a log of changes made; hardware layouts, lids, lighting, and their effects to the best of my nano-rookie ability before starting the tank cycle. First, is it worth it to start all over with finer grain sand? I'm not a particular fan of sugar sized sand (very fine, often called polite) either. There typically is something in between. So is it worth replacing? I suppose it depends on your plans (for maintenance, and flow). Very high flow will blow smaller sand particles around (at least until they develop a bacterial film). It's actually a tough question to answer for somebody else. A number of our users might even recommend a similar grain size. You can try it if you like. I just prefer a little smaller grain size. 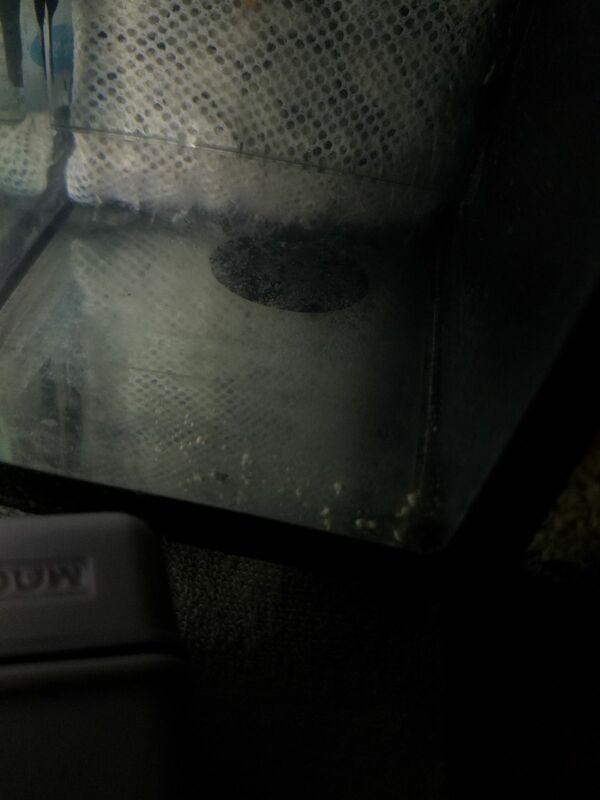 Second, Would you run any filter material in front of my plastic strainer in the 1st chamber after removing the media bag/rubble from the second chamber. I haven't really heard of a plastic strainer in the back chambers. I would guess that just filter floss would be all that is needed/recommended for mechanical filtration. As far as chemical filtration, I would recommend a good activated carbon like Seachem Matrix Carbon (in a media bag). And if you need help reducing phosphate, you can always add a bit of Seachem Phosguard to the bag. That should be all you need. recommends on coral to start with? Hmm... a lot depends on your personal tastes. I'm going to point you to our latest pico contest for ideas. That's good. I would wait until after the diatom bloom (if you get one) before you add anything. It can be frustrating to battle something with coral already in your tank (although diatoms are usually quite easy). I have a guideline that I try to abide by. Never add anything (besides possibly an addition to your cleanup crew) when you are having any problems. Additions should only be done when things are going well. And avoid impulse buys. Plan what you want and when you want to add it (pass on that sale that looks oh so tempting). 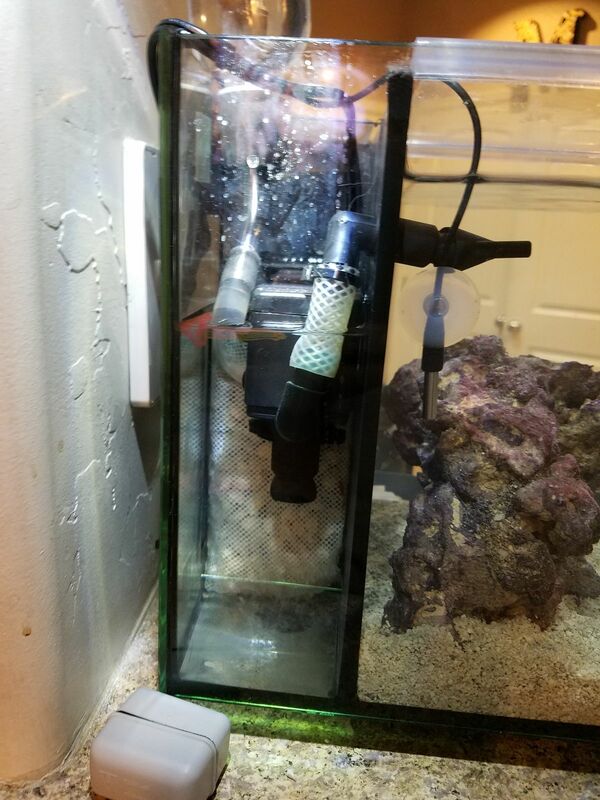 I have the same tank, but I use it for freshwater. If memory serves correct, someone had the same tank not 3-4 months ago and upgraded to an ADA tank (their personal preference I believe). Is the "sump pump" the stock one? It doesn't look like mine, but if it is, I wouldn't expect much flow out of it, and it also tends to clog easily. Personally, I would splurge and ditch the hydrometer and pick up a refractometer off Amazon or Ebay for $25. 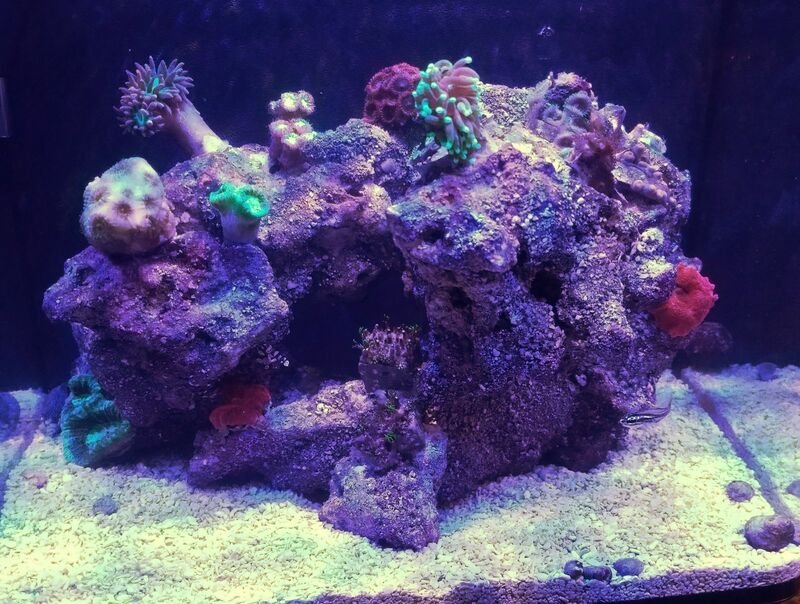 As for corals, I believe that light will grow everything up to SPS since the tank is so small. Personally, I keep dreaming of ditching this tank as freshwater and stocking it with rock flower anemones. 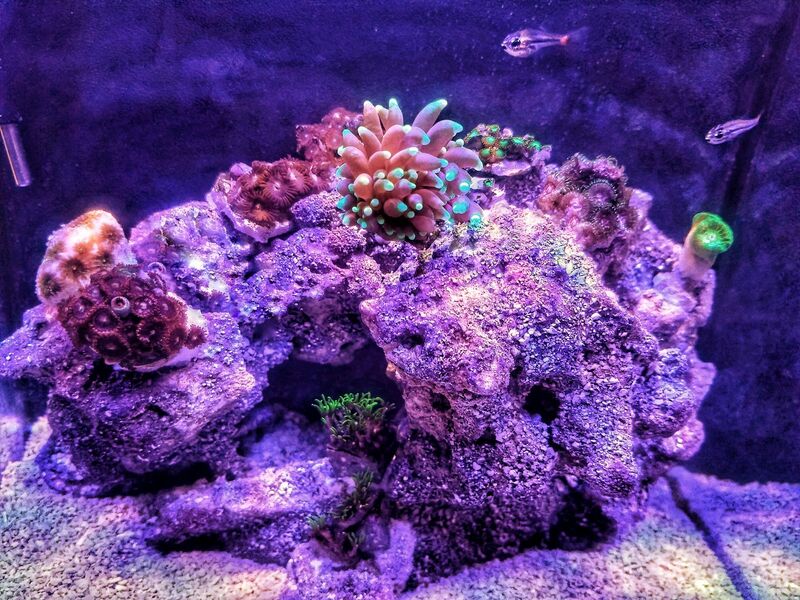 I think an older account used the same tank and did pulsing xenia. If you're interested in that one, it's called the "poopico" because he put it on the bathroom counter. God knows how I remember that though. Tatortaco: the sump pump is upgraded for a much larger 160gph pump. The stock pump has a screen you can remove that may help your clogging. I picked up a refractometer today. 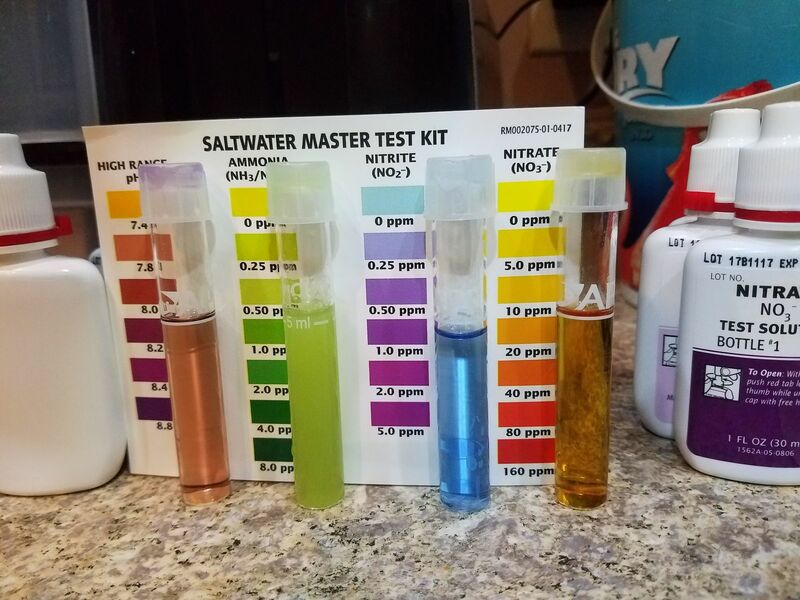 After testing my water sample at a local shop the salinity was higher than my cruddy old one measured. 2.5 weeks in. Salinity has remained on point since adjusting. 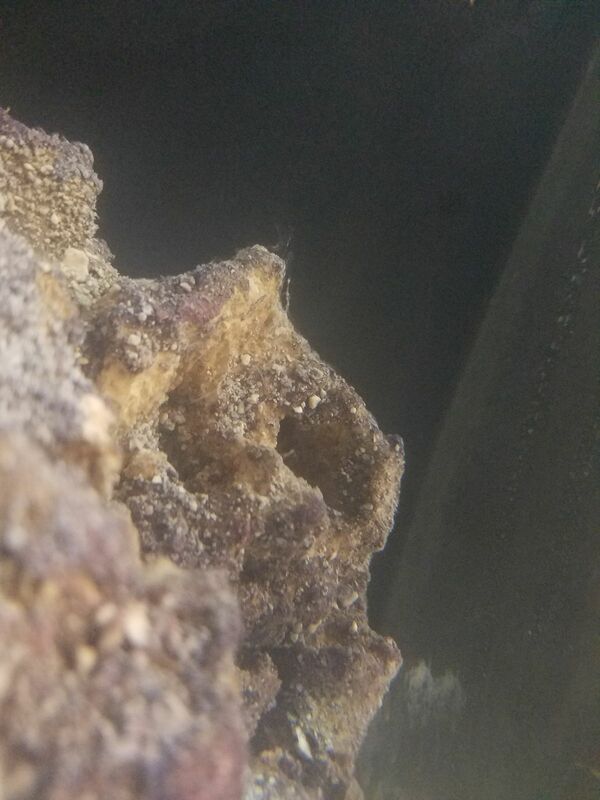 I'm seeing buildup on the rubble media bag and some parts of the main rock but mostly forming on the bottom of the media bag before the return pump. None in the sand or glass/back. The "cured dry rock" Is starting to form growth...but nothing that has caused a measurable cycle. I have tested a few times since starting. And have always came up with nearly the same results. NOT in a hurry to kick off the cycle, but how long should be okay to send in a small cleaning crew. Another question about temp, have been running without a lid and maintaining 79.6 F. But with ANY lid I have tried it stays 81.5 to 82.3 F. Should I build a mesh type lid, or just deal with the higher temps, or go without. If there is no ammonia source, there will be no nitrate. If you are using dry rock, with no live rock, you should dose ammonium chloride to 2ppm, wait for it to come down below 0.25ppm, and repeat until it can do it in 24 hours. The biofilter will then be established. Now change out all the water, wait another day, and add livestock slowly. Added some livestock last week Sunday. Also found a pair of redspot cardinals that are loving the tanks flow. 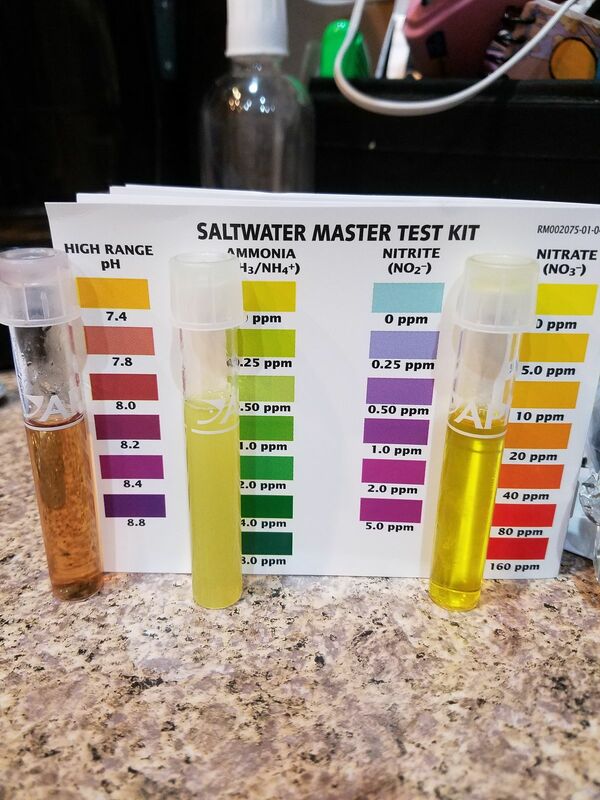 Did the first water change today. 1 month, 1 week in. 30% water change. Planning on 30% weekly. I gotta ask, does the personal stress of your reefs surviabily ever fade with time?? I feel like I have been watching my newborn child stuck in NICU for the last month and a half. Lol. Note: this is 24hrs after a 50% water change. After a few months everything will stabilize and settle into a nice groove. 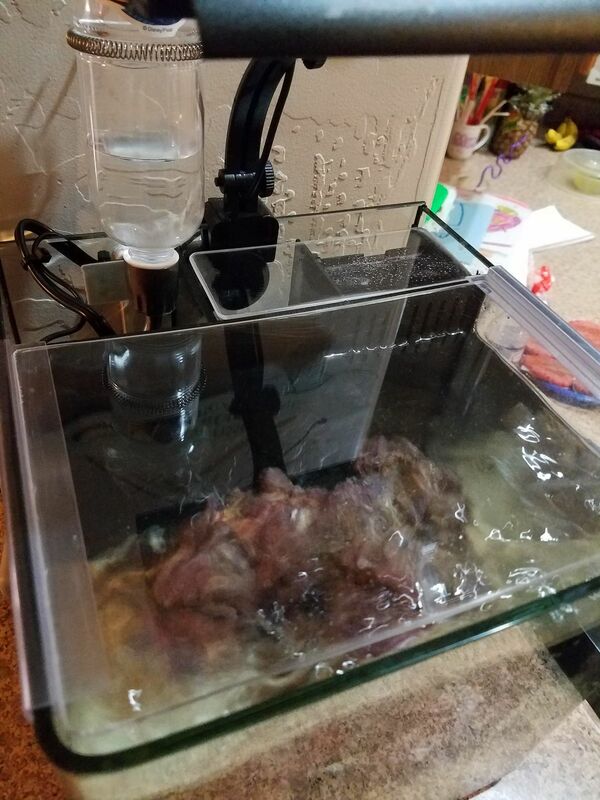 Then you don't have to test as frequently, just enjoy your tank and watch your inhabitants for any signs of stress. Hmm... looks like ammonia has crept up. Not sure if that's due to the water change or the addition of livestock. 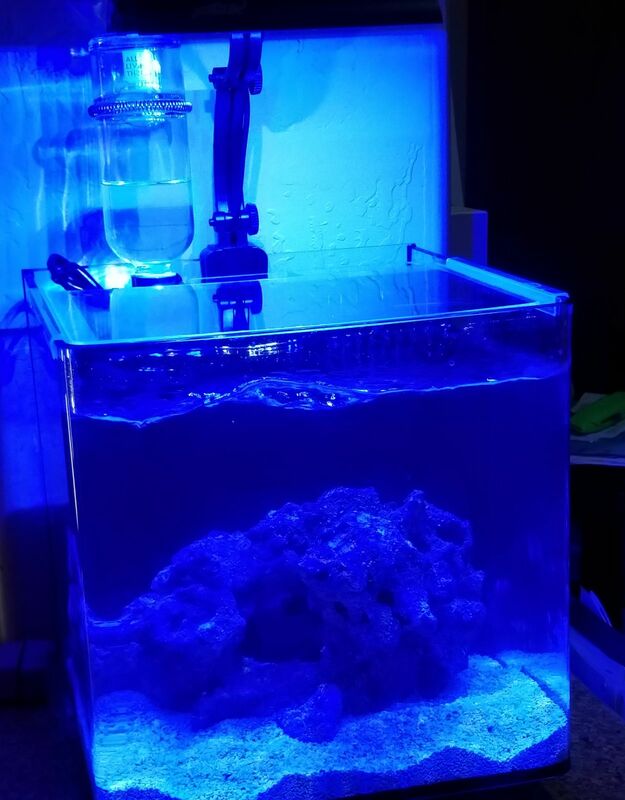 Test it PRIOR to the water change. 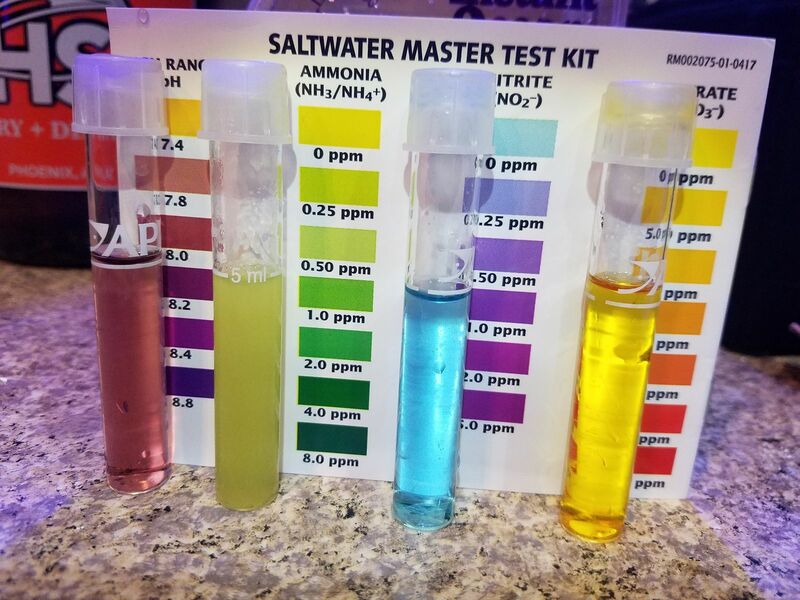 Newly mixed saltwater often contains some ammonia. I tested about 15min ago which was about 7 hours after the 30% change. 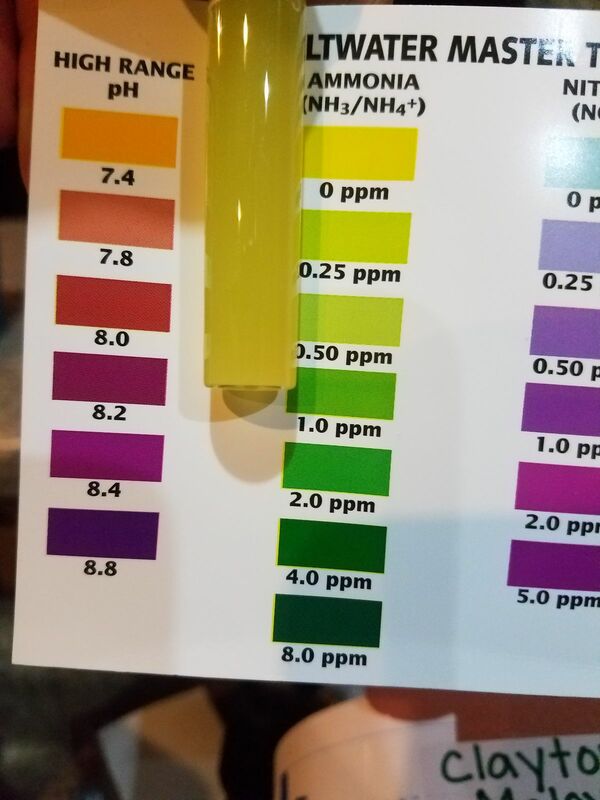 Ammonia dropped to .25ppm. I will retest later tonight and likely change a bit more water. You might want to have some Seachem Prime around to help deal with the ammonia while your biofilter catches up. 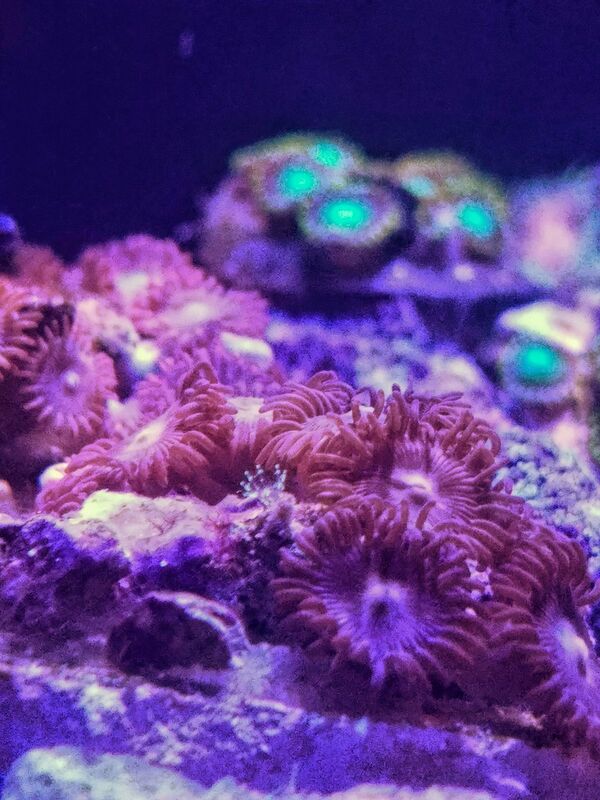 Added NEW ammonia test photo 24hrs AFTER the tanks first 50% water change to my above post. Everything seems to be going well. 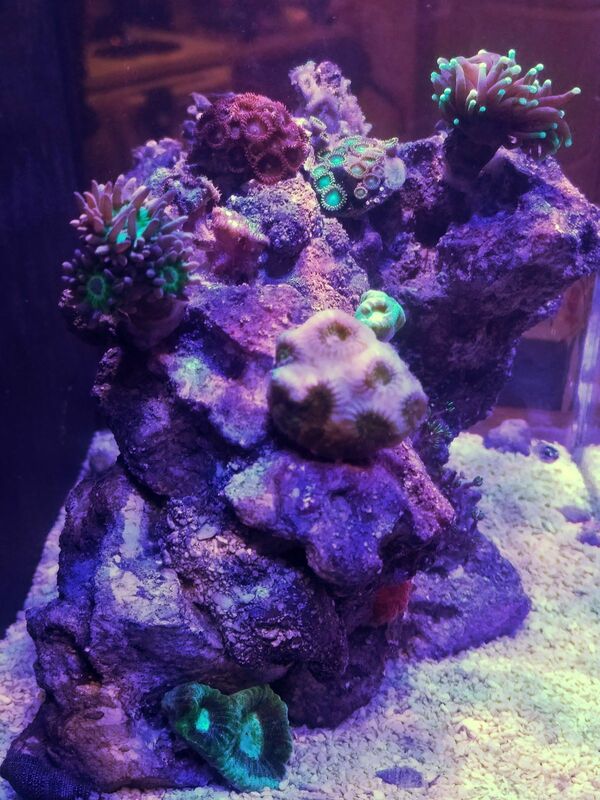 Some of the zoa frags are already reaching out and grabbing hold to my base rock after about weeks time. 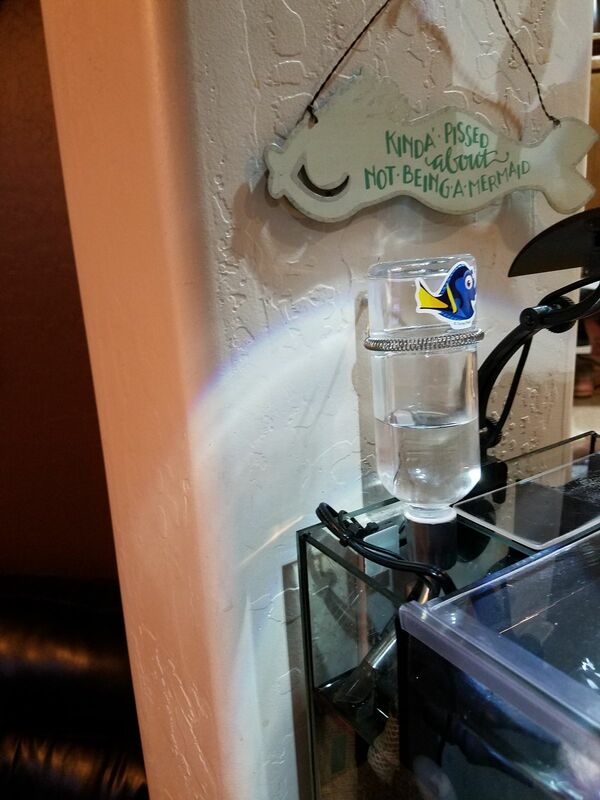 I have fed the redspot cardinal fish squashed up mysis shrimp (they don't like the larger pieces much) through a syringe every 2 to 3 days. Although I've heard these fish have high morality from lack of feed. Anyone know of care for these guys firsthand? 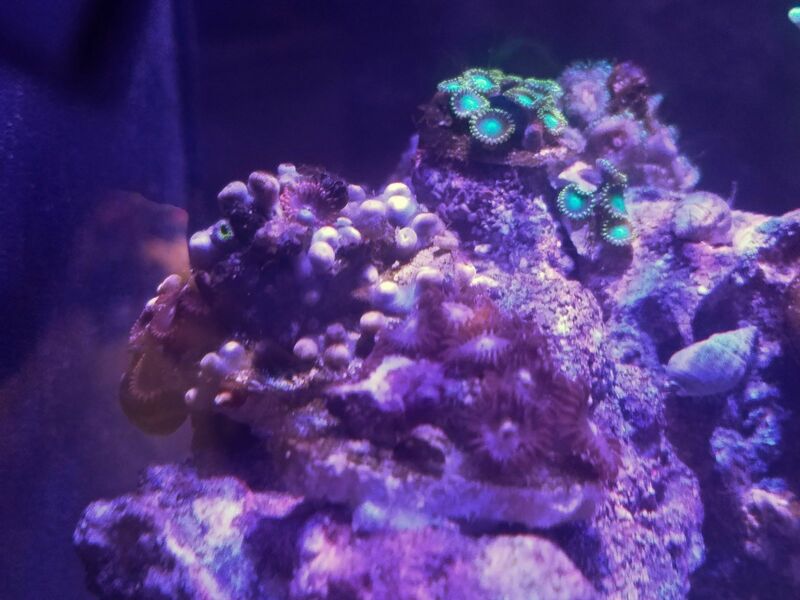 What type of creature has hitch-hiked on my frag. Been looking at it for a week now, mostly translucent looks like gsp' s and pulses every so often. The brown dusting is diatoms. They should go away after they consume the available silicate. In the meantime, some things will eat them and you can siphon them out if you wish. The hitchhiker is a tiny anemone. They are not as invasive as aiptasia, but they can still irritate surrounding coral. 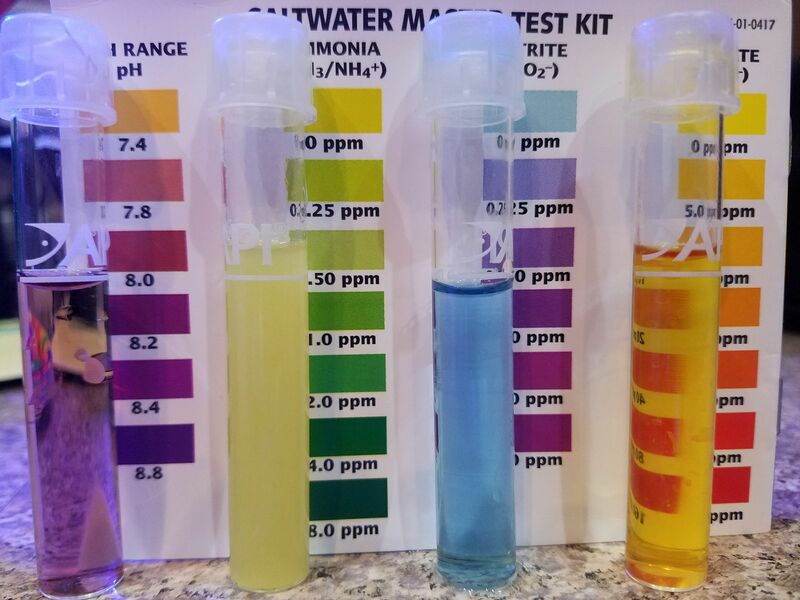 All water test parameters are right on with the exemption of 0.25 to zero ammonia. 1: One of the red spotted cardinal fish died, I couldn't get that fish to eat. Pumps off and syringe fed. Only a single cardinal remains that DOES eat... should I be rid of it as well as they are schooling? 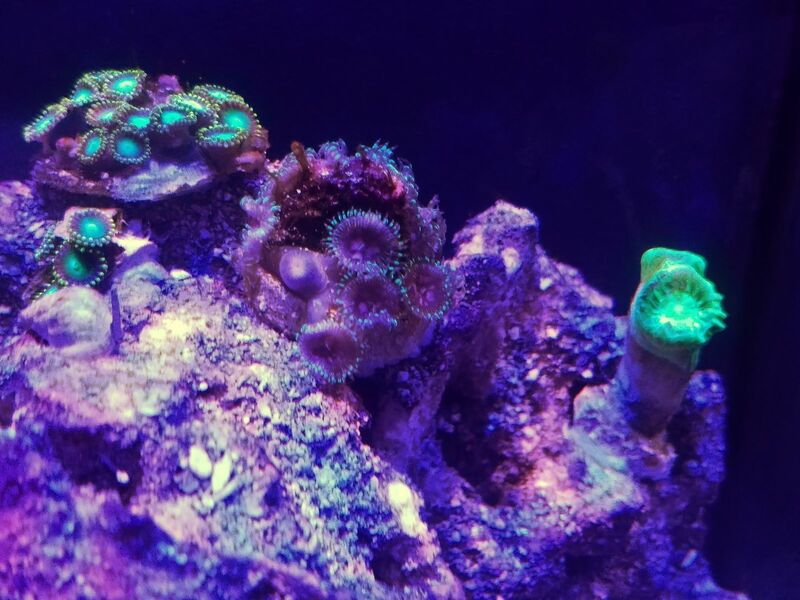 2: one of my zoa frags refusing to partially open for 1 day now. The rest are okay. Should I try moving it out of higher light and flow or just wait? 3: I am noticing rust colored feather looking algae forming all over over but mostly on high spots on the rock over the last few days. But I even have spores of it cling to my glass where water flow is high. 4: Yesterday I added 3 bumblebee snails, and 3 cerith snails. All 6 which have been working hard. And I was impressed with the work they got done overnight. Should I add a small turbo, or emerald crab, blue leg hermit as well?